Make as many websites as you want - A one-time purchase of SiteSpinner enables you to create as many websites as you want, with as many pages per website as you want. You don't need to know how to code - SiteSpinner is easy to use website design software - move anything anywhere with the click of your mouse. No need for image editing software - Change the size or properties of pictures directly in the SiteSpinner work-window. No need for FTP software - Publish directly from SiteSpinner to your web host. Everything is automatically gathered up and published. 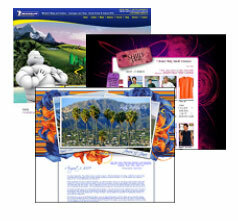 Templates - SiteSpinner web design software includes quality templates for you to use to build your site. Create mouse-over effects, create Forms, Spell Check your pages and more! Get Stuck, Get Help - Get all the help you need. We provide ongoing, unlimited online support. "Getting all elements properly placed on a Web page is notoriously difficult. Overcome this problem with SiteSpinner"
SiteSpinner Awarded Tucows Highest Rating!